How to Enable HTTP to HTTPS For Custom Domain In Blogger | BloggersStand ';-1!=b.indexOf("img.youtube.com")&&(a=' ');d=a+''+p+''+titlex+"
Hello friends we are again first in sharing the blogger supports https for custom domain. we always try to serve best to our loyal visitors. Today we are going to share, How to enable https in blogger custom domain from draft.blogger.com. However Blogger.com not yet announced the https for custom domain and you can see that on blogger dashboard there is no information about this. But if you go and login from draft.blogger.com , when you will go to settings and basic setttings section you can change it's in under trial and you can enable it for there for your custom domain, however before it was available for only free blogspot domains. In order to get enable HTTPS on your custom domain go to draft.blogger.com then from dashboard go settings>Basic as shown below in the screenshot. Now you can seee HTTPS availabilty is on NO mode. 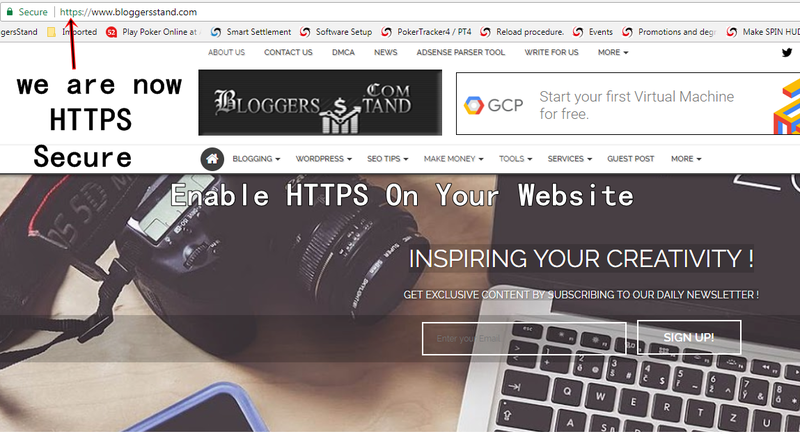 Turning on HTTPS availability will allow visitors to view your blog/ website over an encrypted connection by visiting https://www.bloggersstand.com. If your setting is like this then your blog url is changed to HTTPS from HTTP and its ready to use. And you also enable HTTPS redirect to yes for blog/website to be accessed using HTTPS only.If there is any link with HTTP it will automatically redirect to HTTPS and also if your visitors have bookmarked your blog with http and they are accessing http they all will redirect to HTTPS version of your website. After activating the HTTPS for your blog your ads will disappear for sometime. But you don't need to worry for anything google take some time to check your version for availabiltiy of adsense ads for your blog. Now HTTPS is active on your website you need to change few things.We recommend to everyone follow this step for your blog. Edit all your urls from http to https of your blog.It's very easy to use just go to your theme>edit html and press CTRL+SHIFT+R at same time and enter your old blog url i.e something http://www.domain.com in the box that appears right side of the top corner and click enter after that now enter your new url with https://www.domain.com and click enter doing this will replace all your http urls to https but don't forget to take backup before doing this. Now check your website template for mixed content error. if the https is not in green color and it shows in black color that means your template has mixed content, first fix the mix content then it will turn green Secure on your blog. Also add new search property in google webmaster tool, we have already share how to add website property in google search console with using https. submit all types of url. Google improve those site ranking in search console which are using HTTPS in thier websites or blog. So i will surely increase your ranking in google search engine. Tutorial on How to enable, activate http to https in blogger blogspot custom domain.Make website secure after turning on https in blogger website. 0 Comments on "How to Enable HTTP to HTTPS For Custom Domain In Blogger" So Far - Post Yours!